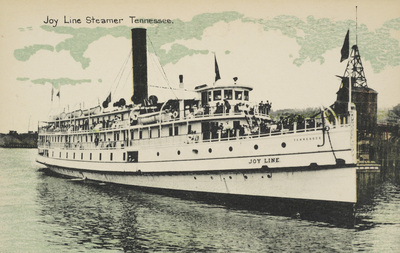 "Joy Line Steamer Tennessee." by R. Wilkinson, 55 Eddy St. Providence, R.I.
R. Wilkinson, 55 Eddy St. Providence, R.I.
R. Wilkinson, 55 Eddy St. Providence, R.I., "Joy Line Steamer Tennessee." (1915). Rhode Island Postcards. 409.